It sparked an interesting thought, why do we (as society) feel the need to comment when something is perceived as healthy? Surely, eating healthy should be seen as normal, the status quo and not something really worth comment. Let’s take an example of using unleaded petrol in a car. When you put unleaded petrol in a car, people don’t say ‘Ooh, you’re putting unleaded petrol in your car’, it’s the norm so you just do it. Likewise, you wouldn’t comment if someone watered their lawn with water it’s just normal. However, if you were to put diesel fuel in an unleaded car, or water your lawn with Lucozade, THEN it would be worth comment. You’d destroy the car engine or likely kill any grass on your lawn, well maybe Lucozade actually works on grass. I’ve never tried, although hopefully you get the point. When we don’t put the right foods into our bodies, they don’t operate as well and eventually it can and will destroy your body. To me, that’s worth comment and I think as society we need to shift our perception of being healthy as normal. It shouldn’t be such an issue, it should just be what we do. P.s. the lunch wasn’t just healthy, it was delicious. How did you a) cook the chicken at work and b) steam the veg? My best efforts are always re-heats in the microwave which renders chicken tough and veg tastless. 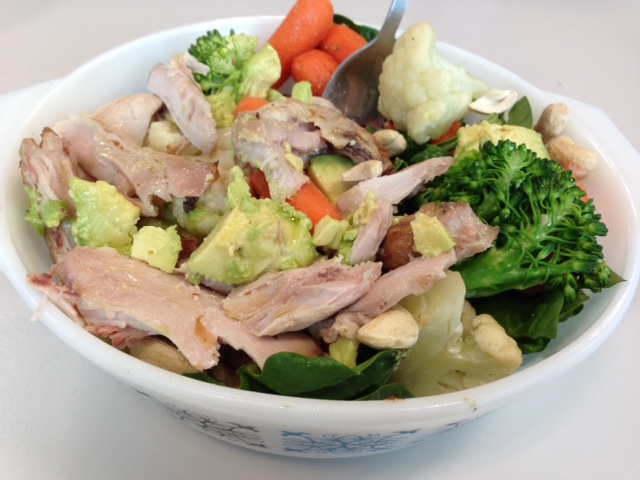 How did you a) cook the chicken in the office and b) the veg? My efforts always involve reheating in a microwave which renders chicken tough and veg tastless. The chicken (which I admit is not the best quality) was some pre-cooked chicken thighs. Usually I like to pre-cook my own chicken at home at eat it cold. As for the veg, I buy the veg bags and steam in the microwave, although I take 1 minute off the recommended cooking time to keep it nice and crunchy. Tastes just like it’s steamed fresh at home. For a bit more flavour I add olive oil and you could also sprinkle some sea salt or balsamic on it too.